Billboard companies and others with a vested interest in sign regulations spent more than $1.1 million lobbying city councilmembers and other city officials in 2011, according to reports filed with the Los Angeles City Ethics Commission. An obvious item of major interest to Clear Channel, CBS Outdoor, Lamar Advertising and others was the citywide sign ordinance approved by the City Council’s PLUM committee late last year. Three other companies–Martin Outdoor, Norman Bus Bench, and Creative Outdoor–were bidders on a new bus bench advertising contract approved by the City Council earlier in the year. Non-sign companies seeking large entitlements from the city for signage also spent big on lobbying in 2011, although the Ethics Commission reports do not reflect a breakdown between lobbying on signage and other development issues. 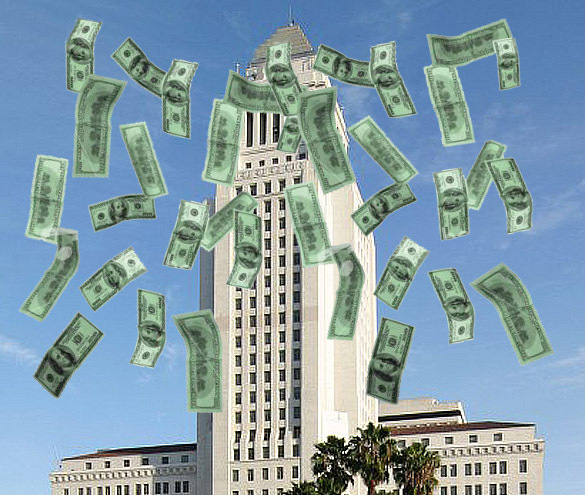 The developers of downtown’s new Wilshire Grand project, Hanjin International and Thomas Properties Group, together paid $198,000 to lobbying firms. In addition to entitlements needed for the $1 billion-plus project, the companies successfully sought approval for large amounts of digital signage to display commercial advertising on the building’s facade. But that amount pales in comparison to $1.877 million reported by lobbying firms representing AEG, the owner of Staples Center and L.A. Live. The company, which is seeking the city’s approval of its plan to build a new NFL football stadium next door to the city convention center, has proposed more than 50,000 sq. ft. of billboards on the convention center facade as well as advertising signage on and around the stadium.